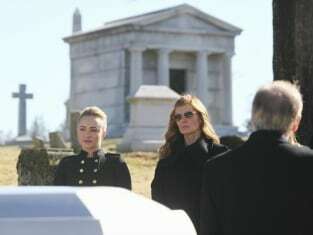 Rayna said goodbye to her father on Nashville Season 2 Episode 15, an installment appropriately titled "They Don't Make 'Em Like My Daddy Anymore." Elsewhere, Juliette's new single caught the attention of a famous producer, who wanted to bring her to Los Angeles to record it, marginalizing Glenn in the process. Meanwhile, Scarlett felt lost and alone, but found Liam to be a receptive confidante - and all this went on with plenty of terrific Nashville music played and sang along the way.